2018, A challenging year, yet ticked off by BOC preserving its undisputed market leadership. 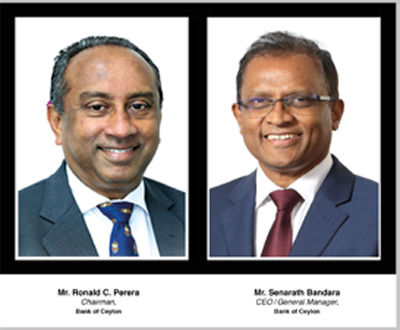 Bank of Ceylon, having nearly completed 80 successful years, has closed 2018 with another spearheading record of Rs.31.9 billion Profit Before Tax (PBT) with a growth of 5% along with the spearheaded growth reported across its balance sheet, stated CEO/General Manager Mr. Senarath Bandara. These notable achievements once again propagate the readiness of the Bank to continue with its undisputed market leadership by outperforming even in midst of a challenging environment. The total operating income has grown by 20% within the year notching Rs. 89.0 billion mark. Net interest income has contributed to 74% of the total operating income and the ‘Year on Year’ (YoY ) growth of the net interest income has been 12%. The growth in interest income raised through the core business of the Bank has been the major contributor for this growth. The net fee and commission income of the Bank has increased by 11% during the year mainly backed by fee and commission income collected through card transactions due to leveraging more on digital platforms. Net operating income for the period reflected 14% YoY growth mainly due to the increments reported in net other operating income and the net interest income. Other operating income of the Bank shows sizable increase with 158% growth mainly due to the exchange gains reported backed by depreciating rupee during the year 2018. Despite the attractive growth reported in all major business lines, the Profit After Tax (PAT) has reported a contraction of 9% due to the impact of income tax expense which has grown by 38% during the year. The Bank recruited over 1,500 young talent pool during the year, yet the Bank has been able to maintain its cost to income ratio at constant at 38% compared to previous year depositing the efficient cost management framework adopted by the Bank. The Bank also had to absorb the impact of prolonged drought which prevailed in some part of the country. The slow phase of growth reported in services sector specially due to the significant contraction of construction segment has impacted the repayments and recoveries. However, the stringent collection and monitoring framework has enabled the Bank to maintain the NPA ratio within acceptable rate.The impact of transition from incurred loss based credit loss provisions model to SLFRS 9 expected credit loss provisions model has resulted in the Bank ending up with Rs. 14.3 billion impairment charge for 2018 by reporting 48% “YoY” increase. Although, the increment is significant on “YoY” the Bank were able to manage the additional impairment charge due to SLFRS 9 within the acceptable range due to the precautionary principles adopted by the Bank in identifying the potential risk. The financial strength of the Bank is showcased by its ability to record Rs. 31.9 billion, the highest PBT in the industry even after recognizing an impairment charge of Rs.15.0 billion into its accounts. This gives a strong indication of the Banks’ ability to continue its strong financial position even in midst of financial shocks which directly impact its profits. The income tax and the tax on financial services and dividend which constitute the Bank’s value to the Government coffers amounted to Rs. 24.1 billion during the period under review. Bank of Ceylon, crossing Rs. 2.0 trillion in its asset base in 2018, was another landmark achievement for the Bank as well as for the financial sector of the country. With this BOC becomes the sole entity in the country to record Rs. 2.0 trillion in assets. The YoY portfolio growth of the Bank has been 24%recording a total gross loan portfolio value of Rs. 1.5 trillion as at end 2018. This growth is notable as it was achieved in midst of subdued economic conditions in the market with contraction recorded in industry sector and trade sector. The situation also triggered with the tight Fiscal Policies adopted during the year as a compelling move in protecting the rupee from steep depreciation against US dollar. The loans and advances accounted for nearly 63% of the Bank’s total assets. Those that contributed most to the growth momentum in the loans and advances portfolio are personal loans, term loans and overdrafts. Deposits recorded a “YoY’ growth of 14%reaching up to Rs.1.8 trillion as of the end of the year.The CASA ratio stood at 34%. However, 20% increase in time depositshas resulted in interest expense on deposits to increase YoY by 21%.Consequent to the previous year the Bank’s domestic liquid asset ratio wasat a moderate level of 24.5% as of end2018. Standing much above the Central Bank’s required benchmark of 20%.The Bank managed to maintain a better trade-off between liquidity and interest earning assets. Mr. Russel Fonseka, Chief Financial Officer of the Bank highlighted that, the Bank also continued to sustain the Capital Adequacy Ratio (CAR) by maintaining the total capital of 14.58% level against the Central Bank’s minimum requirements of 12.875% as of 31 December 2018, according to the BASEL III capital requirements which came into effect from 01st July 2017. He stated further, the Bank managed to report better assets growth while adhering to the capital norms due to better capital management strategies implemented at the Bank and receipt of Rs.5.0 billion capital infusion from the Government also appreciated. The Bank’s Return on Average Assets (ROAA) ratio stood at 1.5% and Return on Average Equity (ROAE) ratio stood at 16.75% which was marginally below the previous year, due to capital infusion took place during the year, which will be materialized going forward. Chairman, President’s Counsel Mr. Ronald C. Perera in a special statement has appreciated the continued trust and the loyalty that has been placed on the Bank by its valued customers which allows the Bank to drive successfully across the strong winds occurred in the macro- economic front of the country as well as in the international markets. The Bank of Ceylon being the Bankers’ to the Nation continues to serves Sri Lankans from all forms of life helping them to build their lives and make themselves financially stable and uplifting the country’s economy. The stability of the Bank is re-accessed in 2018 by all major rating agencies in line with the revised country ratings. Accordingly, Fitch Ratings Lanka re-affirmed the national long term rating as AA+(lka) stable outlook and downgrade the Long term issuer rating (IDR) from B+ outlook stable to B Outlook stable. ICRA Lanka Limited re-affirmed the local rating AAA Outlook stable. Moody’s Investor Services also revised the long term international ratings from B1 Outlook negative to B2 Outlook stable. During the year the Bank was also showered with many accolades in recognition of its brand value, excellence in performance, Annual Report excellence, human resource management, digital products and services and also its efforts in sustainability and CSR. The Bank was adjudged for the Peoples Brand of the year 2018 by the SLIM– NIELSEN People’s Awards, No. 01 Banking brand and the most valuable consumer brand for the year 2018 by the Brand Finance. The Annual Report excellence of the Bank was recognized in 53rd CA Sri Lanka Annual Report awards as the best presented Annual Report and the SAFA anniversary awards 2017, winner and winning three “Gold Awards” by the ARC awards 2018 for written text, financial data and the traditional annual report. The Bank won five gold awards and one silver award for interbank transactions, customer convenience and financial inclusivity in the Technovation awards. The B app of the Bank was recognized as the most popular electronic payment product. The Bank also won the SLT Zero 01 award for the best use of mobile app in the financial sector. Bank of Ceylon was recognized as the Asia’s best employer brand by the Employer Branding Institute-India and the Best HR organization to work for by Global HR Excellence Awards 2018. Bank of Ceylon was also adjudged as one of the top 10 Corporate Citizens in the Country by the Ceylon Chamber of Commerce at its Best Corporate Citizen Sustainability Awards in 2018. During the year the Bank also has took many initiatives to revitalize its digital front, enabling future Banking. This includes opening the Banks’ first Digi Center in Kandy City Center, launching NFC enabled cards and MPOS and enabling NFC enabled ATMs, CDMs and CRMs, re-launching the online banking facility of the Bank with enhanced features to expertise our journey towards a new digital banking era. In the other side, boosting our digital channels has also made us further strengthen the cyber security infrastructure of the Bank and in-line with this, the Bank has established, countries first ever Security Operations Center. In his views, the General Manager, Mr. Senerath Bandara noted the greatest strength behind ending 2018 with high note is, the well experienced and knowledgeable staff of over 8,500 employees dedicatedly working towards implementing the meticulous and timely strategies executed by the management. He also stressed the importance the Bank has placed on enhancing the customer centricity in all avenues of the Bank for a better customer experience. “Although we are moving fast towards digitally enabled banking culture, the weightage we have placed on improving the quality of human touch has never been compromised. We believe the human factor, yet has much more to do with customer care and tangibility”, he further stressed. In marking the closure of year 2018, Bank of Ceylon has adjudged for the “Strongest Bank” in Sri Lanka by “the Asian Banker” and was also ranked among the top 1000 banks by “The Banker” Magazine, UK, re-affirming the steadiness and the soundness of the Bank which is equally competing with the global counter partners.